Also serving communities of South Daytona. There are 22 Assisted Living Facilities in the Port Orange area, with 7 in Port Orange and 15 nearby. The average cost of assisted living in Port Orange is $3,984 per month. This is higher than the national median of $3,346. Cheaper nearby regions include Daytona Beach with an average starting cost of $2,698. To help you with your search, browse the 116 reviews below for assisted living facilities in Port Orange. On average, consumers rate assisted living in Port Orange 4.5 out of 5 stars. Better rated regions include New Smyrna Beach with an average rating of 4.6 out of 5 stars. Caring.com has helped 6 families in Port Orange find high-quality senior care. To speak with one of our Family Advisors about assisted living options and costs in Port Orange, call (855) 863-8283. Port Orange is part of the Deltona–Daytona Beach–Ormond Beach metropolitan area and has received the Tree City USA award by the National Arbor Day Foundation for 34 years in a row. Seniors here make up 24 percent of the population. There are nine assisted living facilities in Port Orange, with another 33 in nearby areas such as Daytona Beach, Holly Hill and New Smyrna Beach. In Port Orange, as well as the rest of Florida, the Department of Elder Affairs oversees Assisted Living Facilities (ALFs), which the state defines as residential care facilities that provide an array of services for its residents. Port Orange, located on Florida’s Atlantic Coast, boasts warm year-round temperatures. July is typically the hottest month, with high temperatures reaching an average of 90 degrees. January is Port Orange’s coldest month, with an average high of 68 degrees. Port Orange’s crime rates are lower than other cities in Florida. The city is safer than about 24 percent of U.S. cities. Within Florida, Port Orange has a violent crime rate lower than the state average. Getting around Port Orange is easier thanks to Votran, Volusia County’s public bus transportation system. Buses run on fixed routes around Port Orange and the surrounding area. These buses are wheelchair accessible, equipped with lifts and ramps, so that people of all abilities can ride them. The Port Orange area is home to world-class medical facilities, including Halifax Health Medical Center, in the event of medical emergencies or illness. Port Orange’s Adult Activities Center offers opportunities for seniors to learn, socialize and stay active. Seniors can sign up for painting, writing or judo classes or enroll in the 10-week Get Fit Port Orange program that runs every spring. Port Orange has an array of community resources for seniors, including the Council on Aging, an organization that provides resources, activities and care for seniors as well as seven senior centers. Assisted Living costs in Port Orange start around $3,984 per month on average, while the nationwide average cost of assisted living is $4,000 per month, according to the latest figures from Genworth’s Cost of Care Survey. It’s important to note that assisted living rates in Port Orange and the surrounding suburbs can vary widely based on factors such as location, the level of care needed, apartment size and the types of amenities offered at each community. 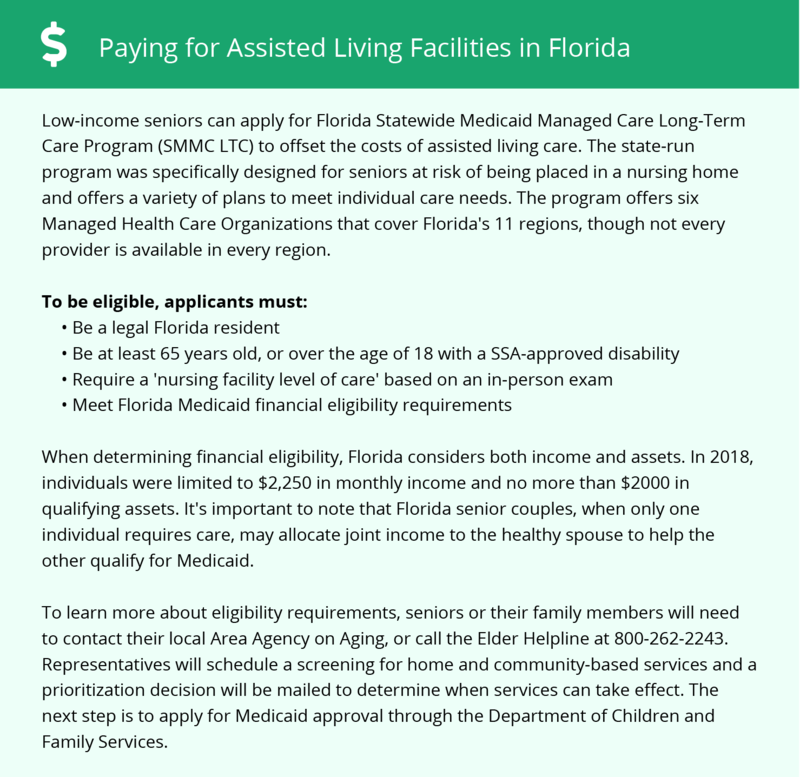 Florida provides optional state supplementation (OSS) to seniors who live in ALFs and receive Federal SSI benefits. The state also has two programs, Assistive Care Services and Medicaid Long-Term Care, that can pay for services at assisted living homes. While OSS can be applied to room and board, these plans do not cover those expenses. Port Orange and the surrounding area are home to numerous government agencies and non-profit organizations offering help for seniors searching for or currently residing in an assisted living community. These organizations can also provide assistance in a number of other eldercare services such as geriatric care management, elder law advice, estate planning, finding home care and health and wellness programs. To see a list of free assisted living resources in Port Orange, please visit our Assisted Living in Florida page. Port Orange-area assisted living communities must adhere to the comprehensive set of state laws and regulations that all assisted living communities in Florida are required to follow. Visit our Assisted Living in Florida page for more information about these laws.